I don’t know any woman who doesn’t have some part of her body she would like to improve, me included, but I no longer feel I have to ‘punish’ my body into a certain form. Instead, I try to attain a long loving relationship with it. I am not going to tell you about a 24 hour crash diet or miracle fitness work out. What I will tell you about are my favorite products and treatments that will leave you feeling pampered. Plus, they will immediately improve the look and feel of your skin and get it ‘beach ready’. Dry brushing is easy to do; it takes less than 5 minutes and it’s great for sloughing off dry flaky skin. It increases the circulation and releases impurities You will see improvement in the look and texture of your skin right away. Dry brushing aids in the elimination of toxins from the body. Use a brush with natural bristles like 100% wild boar or similar. The bristles should be stiff but not too hard. Look for one that has a handle long enough to reach your back. You should only brush towards the heart, making long sweeps, scrubbing in a circular motion. Start at your feet, moving up both sides of the legs. Make small circles at your knees. Direct the brush counterclockwise on your stomach. Next, you’ll work from the arms toward your chest, moving your way down your back. Brush several times in each area, but not too hard; this should be an enjoyable experience. Skin should be invigorated but not irritated or red. Dry brushing works most beneficially when it’s performed daily. It opens the pores and stimulates the lymphatic system which will help the body eliminate toxins. You will notice your skin is smoother with a rosy glow! You may even notice an overall improvement in the function of your organs. After brushing, your lotions will absorb more quickly, so treat your body to natural, chemical free skin care products. 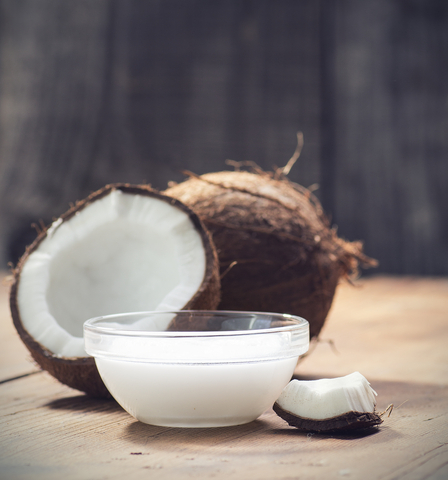 A particular favorite of mine is Raw Organic Extra Virgin Coconut Oil, one of natures most amazing gifts. It contains beneficial vitamins and minerals like Iron for oxygen transportation and vitamin E, an antioxidant vitamin that protects cells from damaging free radicals. Another natural oil I love for my body is Meyer Lemon infused Cold Pressed Olive Oil. It feels and smells wonderful on my skin. Once your skin drinks in your oil or lotion, it’s ready for self tanner. My first choice for self tanner is St. Tropez Bronzing Mousse. It will give your skin rich, long lasting color that will deepen over a few hours time; and it has a pleasant fragrance. I recommend the applicator mitt, sold separately, to ensure an even streak-free application. I have spent a lot of time trying to find a good moisturizing natural sunscreen for the face and the body. A lot of natural sunscreens are drying and leave a chalky film on the skin, but these brands. DeVita natural skin care products are very hydrating, partly because they contain hyaluronic acid. For my face, I use DeVita Solar Protective Moisturizer. It’s moderate priced and blends well with serums and make up. Their C Serum is great too, as well as their Rose Facial Toner. It smells heavenly! Aveda’s Daily Light Guard SPF 30 is formulated with 100% mineral-derived sunscreens with UVA/UVB protection and features advanced coating technology that makes zinc oxide and titanium dioxide glide on sheer and smooth. Daily Light Guard contains organic kukui seed oil and ginger extracts. It feels silky and instantly disappears on the skin. Foundations and powder can be applied on top smoothly without any chalkiness or balling. For getting sunscreen on to those hard-to-reach spots, Aquasentials has an easy lotion applicator with a long curved handle. Bass products developed a nice folding applicator, convenient for traveling or carrying in your beach bag. Natural sunscreens not only protect the skin from sun damage but they also safeguard our ocean reefs from the damage caused by the chemicals found in synthetic sun care products. Enjoying a good yoga stretch for the hips and thighs after a long walk on the beach. To have beautiful, healthy skin for the long term, nothing beats a wholesome diet filled with a variety of fresh fruits and vegetables along with daily exercise. Your body is your vehicle. Love it. Take care of it. ∗ I have not been paid or compensated in any way to endorse the products mentioned in this blog.